E2TAG having sequence SSTSSDFRDR or GVSSTSSDFRDR and antibodies specific for the peptide tag are covered by PCT Patent No PCT/EE01/00001 held by Quattromed Ltd. End-user is granted to use the licenced technology solely for internal research purpose only. This antibody should be used in conjunction with the E2 tagging vectors (links to the appropriate datasheet can be found in the Related Products section at the bottom of the datasheet). Our Abpromise guarantee covers the use of ab977 in the following tested applications. WB 1/1000 - 1/5000. Incubate for 1 hour at room temperature. Background can be reduced by adding NaCl up to a concentration of 1.5M. ICC/IF 1/1000. Incubate for 1 hour at room temperature. The E2Tag is a peptide which is derived from the Bovine Pappillomavirus type-1 transactivator protein E2 and consists of 10 amino acids(SSTSSDFRDR). The detection of E2-tagged proteins is based on the binding of mouse monoclonal antibodies specific to the tagged recombinant protein. Cos-7 cell lysates (1µg of total protein per lane) were transfected with pQM vectors encoding two different E2-tagged proteins. Detection is performed with anti-E2Tag antibody (5E11) (1:10 000 in TBST) with and without high salt followed by incubation with goat anti-mouse HRP conjugate (1:10,000). Cos-7 cell lysates (1µg of total protein per lane) were transfected with pQM vectors encoding two different E2-tagged proteins. Detection is performed with anti-E2Tag antibody (5E11) (1:10 000 in TBST) with and without high salt followed by incubation with goat anti-mouse HRP conjugate (1:10,000). ab977 at 1/200 dilution staining human Hela cells by ICC/IF. The HeLa cells were transfected with the fusion DNA construct pQM-NTag/A consisting of E2 tag fused in frame with gene specific cDNA. The cells were fixed with paraformaldehyde and blocked with serum prior to incubation with the antibody for 2 hours. 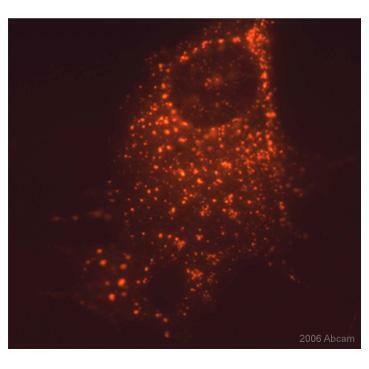 A Cy3 conjugated sheep anti-mouse IgG antibody was used as the secondary. the vial our customer got as a replacement contains only 40 µl, not 100 µ of the antibody #AB977l. What now? For immunoprecipitation and for affinity chromatography we recommend to use ab978 - during further elution milder conditions can be used. We have used ab978 beads for affinity purification of several different proteins in small quantities. 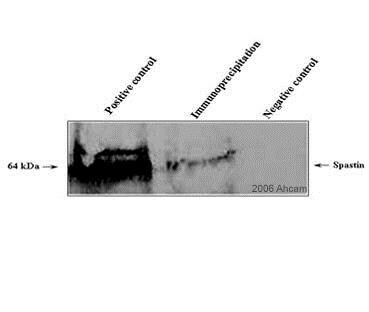 For western blot it is better to use ab977 as this clone has higher affinity than ab978.